Source Code meets Battle of Los Angeles meets Robo Cop. Great CG… Usual Earth vs Aliens plot. Good action. Cruise does a good job with this one. 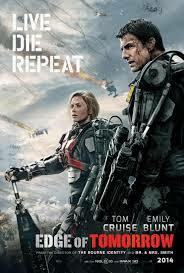 This movie is a mix of “Ground Hog Day” & “The Source Code” with very good action… A little bit confusing in the beginning… Good CG… Good job by Cruise. He’s on a good 4 movie streak. Grade A.